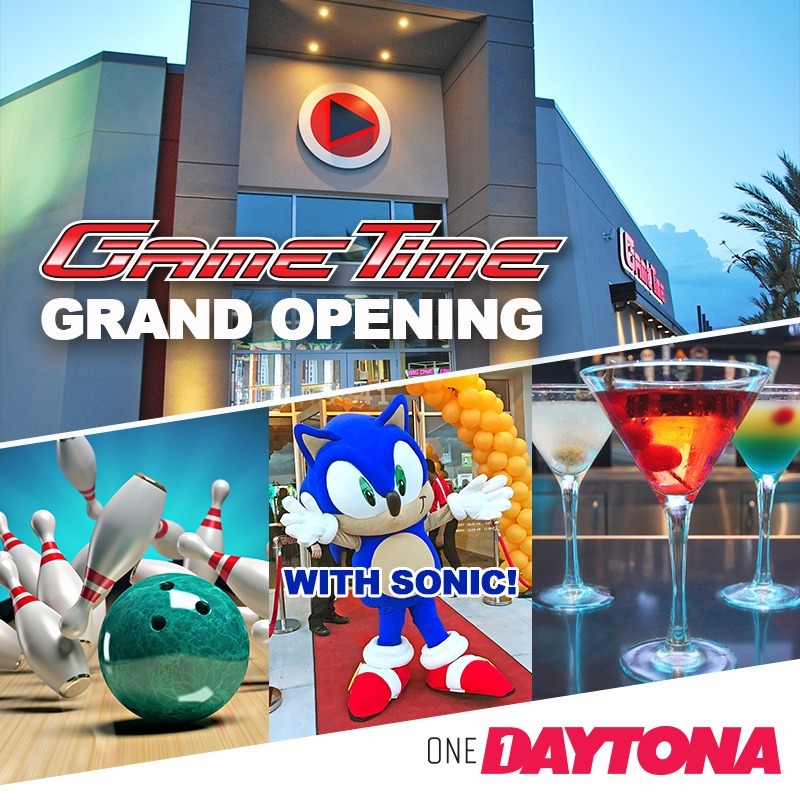 This weekend, GameTime will celebrate the official Grand Opening of their 5th flagship, a 35,000-square-foot family entertainment center located at ONE DAYTONA, across from the Daytona International Speedway. The celebration starts at 11am on Friday, September 28th in a festive setting. Enjoy a Dine N’ Play Combo then 50% off Happy Hour from 4pm – 8pm with special appearance by SONIC the Hedgehog from 6pm – 8:30pm. On Saturday, September 29th from 4pm – 6pm, join Tremble and Kaylee from the 103.3 Morning Vibe giving away prizes and station merchandise. 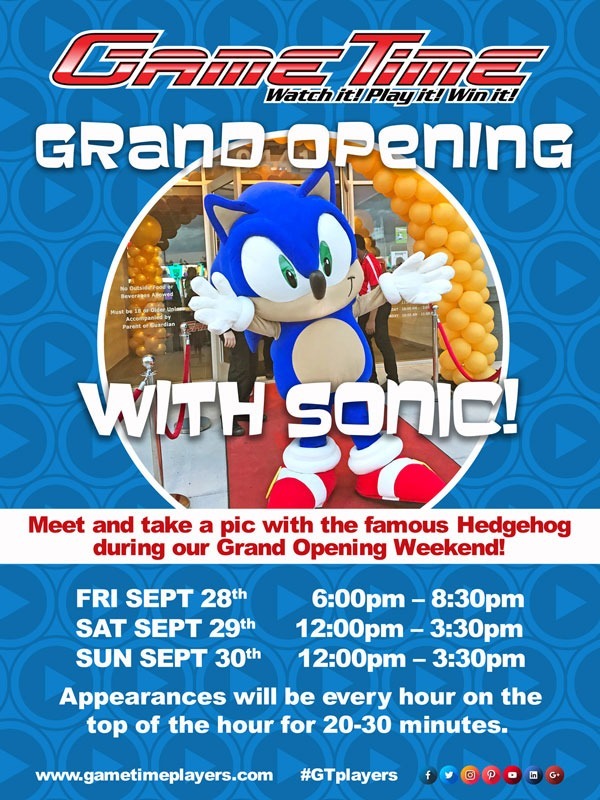 Take a picture with SONIC from 12pm – 3:30pm on Saturday and Sunday while GameTime gives away cool swag, prizes and $5 Football Features throughout the weekend. GameTime is now open and features more than 100 new and retro classic arcade games, prize machines, 12 bowling lanes, private banquet rooms, a full liquor bar with over 70 HDTVs to watch the game and a full-service restaurant serving contemporary American cuisine. Outdoor seating is available with firepits for that extra special ambiance. $5 Football Features are available during all National and College Football games. Choose from Hot Dogs, Wings, Hamburger, Chicken Tenders, Chili, 25 oz Sam Adams draft beer or the new Angry Orchard Rose for only $5 each. Brunch & Play every weekend from 10am – 1pm; enjoy any brunch item plus a $15 All Access game card for only $16.99. Dine N’ Play is available all day, every day; this deal gives you a select menu item plus a $15 All Access game card for only $16.99. Learn more about these promotions at www.gametimeplayers.com.